Golden Age and Other Stories is a charming little anthology that is sure to please fans of Naomi Novik’s Temeraire, though if you are just getting started on the series or are hoping to sample some of the stories here before diving into the main books, this will not be the most ideal entry point. For that, I highly urge you to simply pick up His Majesty’s Dragon, one of my favorite fantasy novels of all time. While I don’t think you have to complete the series to appreciate this collection (I myself have only read the first six of the nine volumes), having some basic knowledge of the world to start will definitely help you out a lot. This anthology also features an interesting format, consisting of six short stories which are then followed by about two dozen snippets termed “Drabbles”. All of them are accompanied by a piece of fan art upon which these tales are based, so not only are you getting plenty of dragon-y goodness with this collection, you’ll also be receiving a generous helping of gorgeous eye candy. But how do the stories themselves stack up, you ask? Well, as with most collections, the offerings here are somewhat unbalanced, hitting both highs and lows. I don’t mind admitting that I was largely unimpressed with the first few stories or any of the Drabbles at the end, but sandwiched between them are several amazing gems that are so good that I would say they are worth the price of admission alone. To begin, we have the first tale called “Volly Gets a Cow”, a short humorous piece that nevertheless left me feeling lukewarm towards it. 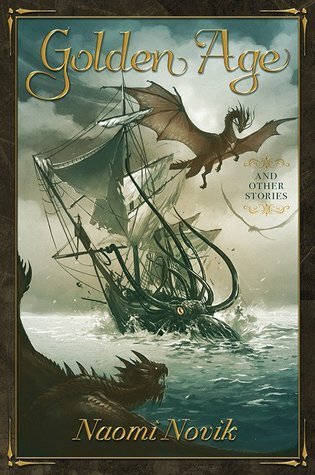 One thing I did like though, was how this was one of the few stories in here that featured Temeraire displaying a deep font of patience as he tries to reign in one of his dragon friends, the playful and distracted Volly who only has eyes for a delicious yummy cow. Next up is a story called “Planting Season”, which fortunately I enjoyed a lot better than the first. It stars a dragon in the Americas named John Wampanoag, who has fallen into a sort of mediator role between the Native Americans and the European settlers in the aftermath of the Revolution. Offering his services as a courier, John has a talent for making negotiations and a sharp mind for getting the best deal out of a trade. I liked how this one offered another view of the world from a different context, accomplishing just what a side story should do. Then comes another dip, I’m afraid, in “Dawn of Battle”, a story starring a young Jane Roland that gives a bit about her background. To my disappointment, of the six full tales in this collection, I thought this was probably the least memorable, though if you’re a big fan of her character then this one may impact you a lot more. Now comes the good stuff: The title story “Golden Age” is a reimagining of Laurence’s first meeting with his dragon. This alternate version has Temeraire’s egg washing up ashore on a desert island following a shipwreck. After hatching and falling in with a group of feral dragons, the lot of them decide to turn to a life of piracy, and their subsequent looting and plundering prompts Laurence to investigate and bring them to justice. Do I really need to spell out why this story was so awesome? PIRATE DRAGONS! Not to mention there’s also a heart-pounding encounter at sea involving dragons and a kraken, which hopefully shouldn’t be a spoiler considering how the image depicting this scene is plastered all over the cover. After all the action, a more emotional, quiet tale is told next in “Succession”, a story about Temeraire’s mother. After laying twin eggs, Qian has to make a difficult decision in order to prevent a rivalry between the princes in the Chinese imperial family. This one really tugged on my heartstrings, reading about a nervous parent fretting for the precarious wellbeing of her growing child, only to find out about a second dragonlet. Something that should have been a blessing becomes the source of even more heartbreak in this beautiful story about motherhood and sacrifice, and I think fans of the series will also enjoy the little insights we get into Temeraire’s origins. Without a doubt though, the crowning glory of this collection is “Dragons and Decorum”, and yes, the title should clue you in on the story’s inspiration, even without the mention of Elizabeth Bennet as the main protagonist. In this lovely, delightful mashup featuring a blend of the worlds of Temeraire and Jane Austen, Elizabeth is sent to the Aerial Corps as a young girl to become a dragon rider, returning home a few years later as Captain Bennett accompanied by her gabby Longwing named Wollstonecraft. Similar to the novel Heartstone by Elle Katharine White, this is a re-imagining of Pride and Prejudice with dragons, but what I loved about this story is that Elizabeth is the dragon rider instead of Mr. Darcy. It’s also quite a close retelling, though I did wish the story had ran a little longer because it was so cute and endearing. Novik also shows what a versatile writer she is, perfectly channeling Austen and the Regency-era style. And finally, we come to the Drabbles, a series of 100-word paragraph-long stories which I honestly could have done without. Like a collection of random notes or passages clipped out of a book, I can see writing them being a fun little exercise for Novik and pairing them with pieces of fan art was also a very unique and cool idea, but for the most part none of them made much of an impression. So, is Golden Age and Other Stories worth reading? If you’re a fan of Temeraire, the answer is absolutely yes. While the early stories and the ending Drabbles may be on the underwhelming side, I wouldn’t let that discourage you from seeking the real treasure found in the intervening pages. I would even go as far as to say standouts such as “Golden Age”, “Succession”, and “Dragons and Decorum” are must-reads, and happily, these three stories make up the bulk of this book. The world of Temeraire is rich and marvelous, and a collection like this reminds me that there’s always something more to discover. I must read this series some day! I’m glad this mostly worked for you. I think it’s nearly impossible to find an anthology where every story is a stand out. OMG so… it sounds like I should read this anthology just for “Dragons and Decorum”? 😀 I loved Heartstone so much and I enjoy Novik’s books, so the combination of the two being mentioned in this post is enough for me. I’m so glad you enjoyed the anthology overall! Dragons and Decorum sounds worth the price of admission!! I need that story in my life now! It was really good! I wonder if it’s available by itself to read/purchase online or included in other anthologies. Definitely worth checking out, through this collection or any other way you can find!